Join the fun as GAA All-Star Hurling players from 2013 and 2012 take to the field in the first match of its kind ever to be played in China. Pitch-side entertainment for the family includes a large kid’s play area, BBQ and full bar facilities. In association with the Gaelic Athletic Association (GAA) in Ireland, Shanghai Gaelic Football Club (SGFC) is proud to host the Opel Hurling All-Stars Tour 2013, to be held at the SRFC in Shanghai, China. 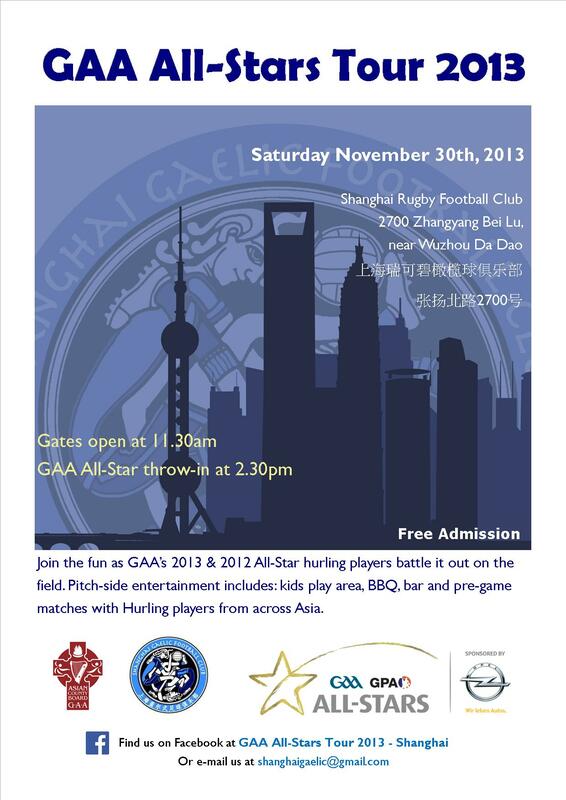 The 2013 GAA/GPA Hurling All-Stars will come to Shanghai on Saturday, November 30th, 2013. It is a momentous occasion for Shanghai GAA and is the first time that the GAA All-Stars Tour has come to China. The main feature of the weekend will be an exhibition match between the 2013 and 2012 Hurling All-Stars with some of the finest players of our generation hurling up a storm. Over 300 people are expected to attend, including a 100-strong delegation from Ireland consisting of the 2013 & 2012 Hurling All-Stars, and high-ranking officials from the GAA. In addition, over 200 spectators and players from clubs across China and Asia will take part in what is one of the main highlights of the Asia GAA calendar.